"A special attack card with lightning-based attacks." 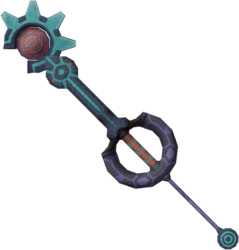 The Photon Debugger is a Keychain for Sora's Keyblade that appears in Kingdom Hearts Re:Chain of Memories and Kingdom Hearts II. The Photon Debugger looks similar to the inhabitants of Space Paranoids, appearing to be constructed of computer circuitry. The Keychain's token is Tron's Identity Disk. Its name comes from two words; debugging is a way to eliminate a computer virus or bugs, similar to how the Keyblade eradicates Heartless. Photons are the fundamental quantum particles that compose light, and Sora is the wielder of the Keyblade of Light. ↑ Only available in the original Japanese release of Kingdom Hearts Re:Chain of Memories after clearing Kingdom Hearts II Final Mix, and in the original English release after clearing "Sora's Story" and "Reverse/Rebirth". This page was last edited on 19 April 2019, at 13:06.